This collection eventually will include between 50-100 Topic Guides (our 101 Doorways series), most of which are priced at $4.99. 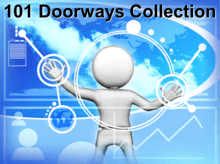 Purchase this Collection now at our special package offer price of $9.99 and get access to all 101 Topic Guides Doorways, both those currently available and to future 101 Doorways as they become available. It’s a great way to ensure easy access to all the big climate change topics covered in the Climate Web.